Origin and Habitat: 25 km South-West of Pofadder, South Africa. Habitat: Lithops olivacea grows among transluscent white and red-stained outcrops of quartzite stones. From stand-up viewing height the pebble-like double leaves blend remarkably with the gravelly ground on which they grow and are lost to sight in this environment. When they are found, it is usually due to their large and brightly coloured flowers flowers. 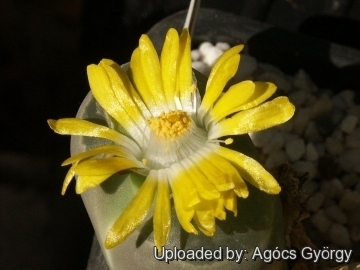 They are sometime found growing along with Dinteranthus microspermus, Lapidaria margaretae and Avonia papyracea, which loves quartz too. 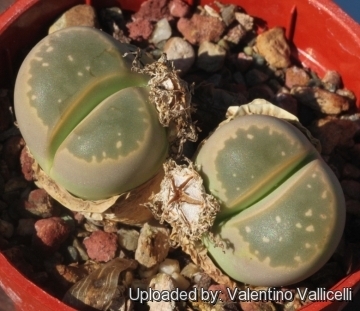 Description: Lithops olivacea is a distinctive specie with large nail-shaped olive green windows on convex upper surfaces, often flecked with a few whitish islands. It is quite uniform and relatively easy to identify. Desmond Cole field number C055: This population distinguishes for having transparent blue green windows. Lithops olivacea L. Bolus: has dark olive-green 'windows', sometimes with a few paler spots. 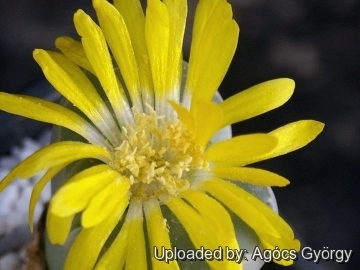 Plants from single heads to clumps of more than 30 heads, to 2 cm high. Leaves olive green to greeny-grey. The species is found throughout Bushmanland. Lithops olivacea C055 25 km SW of Pofadder, South Africa: transparent blue green windows. Lithops olivacea C109 10 km N of Pofadder, South Africa: large open pinkish windows. 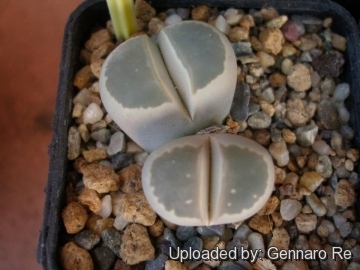 Lithops olivacea var. nebrownii D.T.Cole: Pinkis to rose-brown form. Lithops olivacea var. nebrownii C162B TL: 70 km WSW of Pofadder, South Africa: pinkish clear windows. 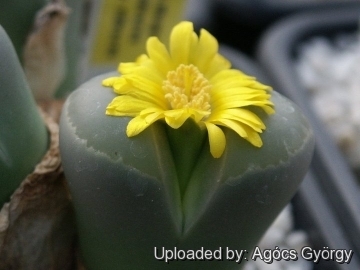 Cultivation and Propagation: Lithops olivacea is relatively easy to grow but great care needs to be taken with soil, temperature, time and amount of watering. It is a winter growing species and heads for dormancy in summer. Growth rate: It is slow growing but clustering in cultivation, if grown correctly, it will reward the grower with generous displays of flowers. Soil: Since roots are quite shallow, use a sandy gravel mixture (e.g. 2 parts sand : 1 part clay loam : 1 part gravel) or a cactus mix with extra perlite or pumice. For best results, use a shallow pot, and only use the smallest diameter pot that will accommodate the plant. Clay pots help the plants to dry out between watering. Waterings: Requires little water, otherwise its epidermis breaks (resulting in unsightly scars). Watering should be very sparing and regular only during the late autumn and early winter months, e.g. no more frequently than once in two weeks, but when watered, they should be drenched so that the water reaches the bottom of the container. Water minimally in summer, only when the plant starts shrivelling. It is also best to water in the mornings so that the excess water evaporates and the upper layers of soil dry out fairly quickly. No water should ever be allowed to stand around the roots. Exposure: Keep cool and shaded in summer, needs full sun or light shade in the other seasons. High levels of light are needed in autumn to flower and for good plant development. The low intensity of sun light during the growing season of this species generally prevents the white flower flowers from opening. Fertilization: Need a perfect fertilizer diet during the growing season. Feed them once during the growing season with a fertilizer specifically formulated for cactus and succulents (high potash fertilizer with a dilute low nitrogen), including all micro nutrients and trace elements diluted to ½ the strength recommended on the label. They thrive in poor soils and need a limited supplies of fertilizer to avoid the plants developing excess vegetation, which is easily attacked by fungal diseases. Some growers fertilize frequently, some hardly ever. However, for the highly succulent mesembs, fertilization is not really necessary. Rot: Rot is only a minor problem with mesembs if the plants are watered and “aired” correctly. If they are not, fungicides won't help all that much. The plant turns immediately to mush when over watered, or watered out of season. Care must be given in watering, keeping them warm and wet while growing, and cooler and dry when dormant. Reproduction: Seeds, cuttings or division. Sow them in spring or autumn. Germination usually occurs within about a week or two. Seed germinate at 15-21 °C. Cover the seeds with a very fine layer of grit and water from below with a fungicide to prevent damping off. For the first 3-4 days cover the pots with a sheet of glass/clear perspex to keep the humidity levels high. Remove the glass and replace it with light shadecloth and mist once or twice a day for the next two weeks after which most seeds should have germinated. From then on mistings can be reduced to every second and then every third day as the little plants grow. The young plants can be transplanted after a year, and flowering can be achieved within 3-4 years. The seed will remain viable for many years provided it is stored in a cool dry place. 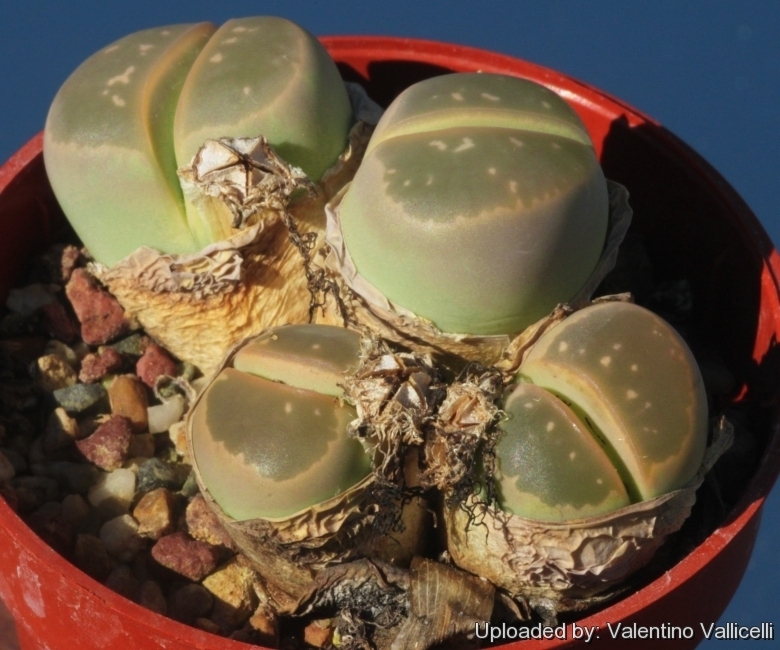 It is also possible to divide a multiheaded plant, but lithops prefer to grow clustered together and many growers prefer to leave them undisturbed to see how large a cluster can get. To separate a cutting from a grown-up mother, lift the plant, carefully cut through the rootstock. Each cutting must contain one or more heads along with a fraction of root and permit them to dry out a couple of days, lay the cuttings on the soil and insert the stem end partially into the soil. Try to keep the cutting somewhat upright so that the roots are able to grow downward.